Set high in the Himalayas, The Abominable Snowman is based on a BBC television play by Nigel Keale entitled The Creature.Keale and director Val Guest were responsible for a number of Hammer films in the late '50s, including The Quatermass Experiment (1955) and Quatermass II (1957). They are noted for producing films aimed at a more intellectual audience, which depend on effective script writing and direction to overcome the meager budgets they had to work with. 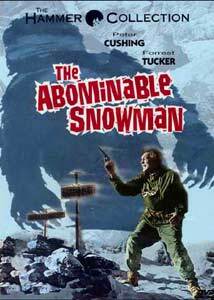 Shot in the French Pyrenees and at Bray studios on the Hammer lot, The Abominable Snowman relies more on unseen terror than on menacing onscreen monsters to create its intrigue and suspense. Botanist Dr. John Rollason (Peter Cushing) is doing field research with his wife in the Himalayas, while staying in a monastery of Rong-Ruk with a group of Tibetan monks overseen by a mysterious Lhama (Arnold Marlé). Their interaction is hospitable until a group of American explorers enters the camp, requesting Rollason join them on an expedition to find the mysterious Yeti. Heading the expedition is Tom Friend (Forrest Tucker), a fame seeking showman, whose true intentions for their hunt are concealed as he tries to enlist Rollason for his scientific background and writings on the snowman. Among his party are McNee (Michael Brill), a young Scottish photographer who claims to have seen the creature firsthand, and Ed Shelly (Robert Brown), a trapper who assisted Friend in organizing the hunt. After producing evidence in the form of a huge tooth concealed in a container stolen from the monastery years earlier, Rollason doubts the Lhama's explanation of the item, especially following the Lhama's comments about a race of super-intelligent beings waiting to take over the world when mankind has destroyed itself. Against the wishes of his spouse, Rollason joins the team, and they set out to locate the Yeti, braving the harsh weather and intense cold of the high mountains. As they head farther into the mountains they find more evidence with the discovery of huge footprints, while catastrophe begins to descend on the party. After falling behind, McNee mangles his leg in a bear trap set by Shelly, and the sight of a huge arm entering their tent sends their Tibetan guide screaming from the campsite. As a series of strange manifestations begin to invade each member's thoughts, Rollason begins to suspect they are dealing with much more than an animal, and upon learning Friend's grandiose and self-serving purpose for the mission, urges that they return to the monastery at once. However, Friend will not be deterred, regardless of the consequences, and so plans are made to capture the creature alive, while the unseen terror lurks in the darkness. The Abominable Snowman works its magic on a psychological level, as the beast we are tracking is not revealed throughout most of the film. We get a sense of forboding from the situations set up, and as the story progresses things go from bad to worse. While the film shows its age from the pacing of the script, it still shines as a great example of '50's horror. The conclusion is satisfying and the underlying premise keep it from being just another monster in the woods type of film. Image Transfer Review: Anchor Bay has served up this disc in its original Hammerscope 2.35:1 aspect ratio, enhanced for widescreen TVs. Unfortunately, there are a couple of problems with the image which degrade its rating somewhat. First is a problem with detailed background elements flickering in and out, most likely due to compression and image stabilisation problems. Contrast is pretty reasonable, though a bit lacking in some scenes in the midtone definition. As expected on a film this age, there is some print damage and dust, though it is not overwhelming or frequent. Overall impressive, but a cut below the best I've seen of films of this age. Audio Transfer Review: Presented in two channel mono, there are no real problems with the audio. Frequency range is limited as expected for a film of this age. The commentary track is a little noisy, but other than that a decent presentation. 1 Feature/Episode commentary by director Val Guest and writer Nigel Kneale. World Of Hammer episode "Peter Cushing"
Extras Review: For extras, we get a feature length commentary by director Val Guest and writer Nigel Kneale. The commentary is edited from independent sessions, with a moderator prompting some of the responses heard in the track. Discussion covers the gamut from the original screenplay for BBC television, to the actors, their processes and shooting in the new Hammerscope format. Although a little dry, there is a lot of information here, though there is often reference to scenes not yet shown, so this wouldn't be considered screen specific. We also get another installment in the World Of Hammer series, this time "Peter Cushing", which examines the career of Hammer's most notable actor. As with all the World Of Hammer episodes, this 25 minute feature strings a series of clips together with commentary by host Oliver Reed. From his vampire chasing character Dr. Van Helsing to his 16 portrayals of the evil Dr. Victor Frankenstein, Cushing was a mainstay at Hammer, and here we have excerpts from The Brides Of Dracula (1960), Dracula (1958), The Abominable Snowman (1957), The Hound Of The Baskervilles (1959), She (1965), The Mummy (1959), Twins Of Evil (1971), Fear In The Night (1972), The Curse Of Frankenstein (1957) and Frankenstein And The Monster From Hell (1974). Video quality is questionable in parts, but these featurettes are still fun to have, though they do contain major spoilers, so be warned! The 01m:30s theatrical trailer for The Abominable Snowman Of The Himalayas (the film's alternate title) is presented in anamorphic widescreen. Included in the case is the US one sheet artwork on sturdy cardboard, with the chapter listings on the reverse. Love these reproductions! Another nice entry in Anchor Bay's Hammer Collection. Fans of '50s horror should enjoy this somewhat different style of film. The supplemental features round out the disc nicely, so if you enjoy a good adventure, put on your snow shoes and parka yourself in front of the screen. It's showtime!